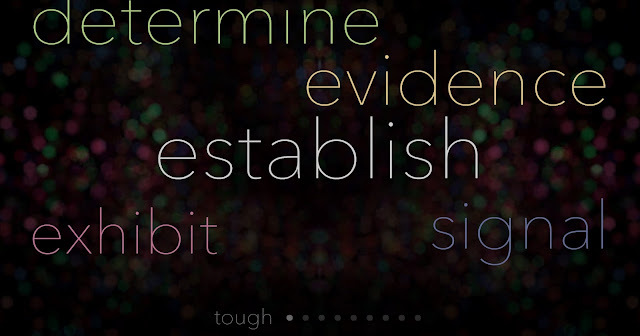 I don't think I've ever played a game quite like Synonymy before and therefore I consider it unique. The concept of assessing your ability to navigate between two words through a network of synonyms as efficiently as possible is a novel one. Games only last a matter of minutes so it's a great little time waster when you don't have that much time to waste! The game can probably be considered educational too as not only do you learn the definition of your target word (which is displayed to you when you start) but you also expand your vocabulary by learning a whole bunch of synonyms along the way. If you're a fan of Richard Dawkins, you'll be pleased to know that he narrates the tutorial (for what that's worth). Apparently profits go to educational charities so you can get that warm, fuzzy feeling while searching for synonyms. I'm not sure if they're still running these but the game at least used to have competitions where you could win actual prizes each week. Neat! Well there's not really much to the game besides hunting down synonyms and it's definitely not going to be everyone's cup of tea. In fact, even if you like the game it's probably not something you're inclined to play for long. The game is a mobile port and it shows. For example, the tutorial shows you using a touch screen to swipe between the screens and the controls are engineered that way. Also, the game isn't full screen by default and there's no exit button (you have to close the window instead). I don't see Synonymy as a game you'd play for a long time, but it's definitely recommended in short bursts. If you're the sort of person who loves reading a thesaurus or likes challenging yourself when it comes to your English vocabulary, this little game is perfect for you. Is the game worth $1.99 USD? : Yes, despite the game being short and the limited gameplay.